Condo Château-Bromont - Ideal place for your summer or winter vacation! An ideal place for your summer or winter vacation! Domaine Château-Bromont is now offering you the possibility to rent modern condos, located directly on Mont Brome, the ideal spot for your summer or winter vacation! 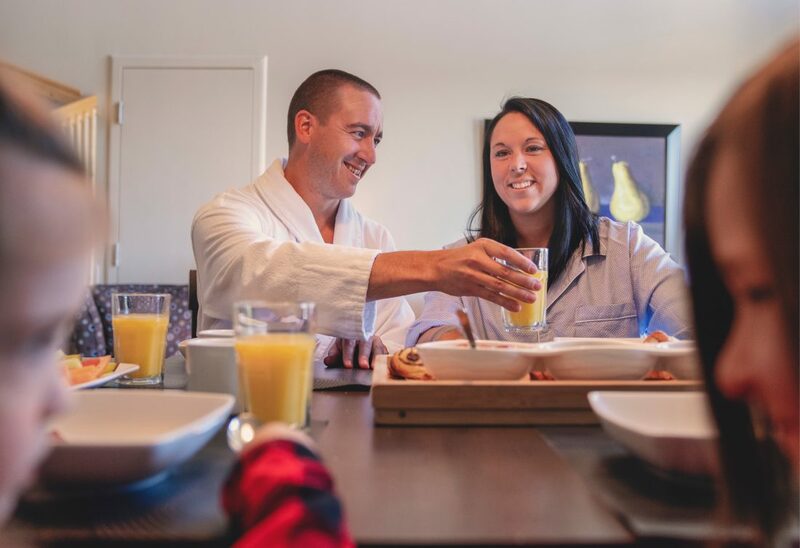 Condo Château-Bromont offers all the accommodations for a long stay whether for work or to spend memorable moments with your family or your better half. The Condo Château-Bromont units all have a kitchenette, a living room and one (1) or two (2) bedrooms. 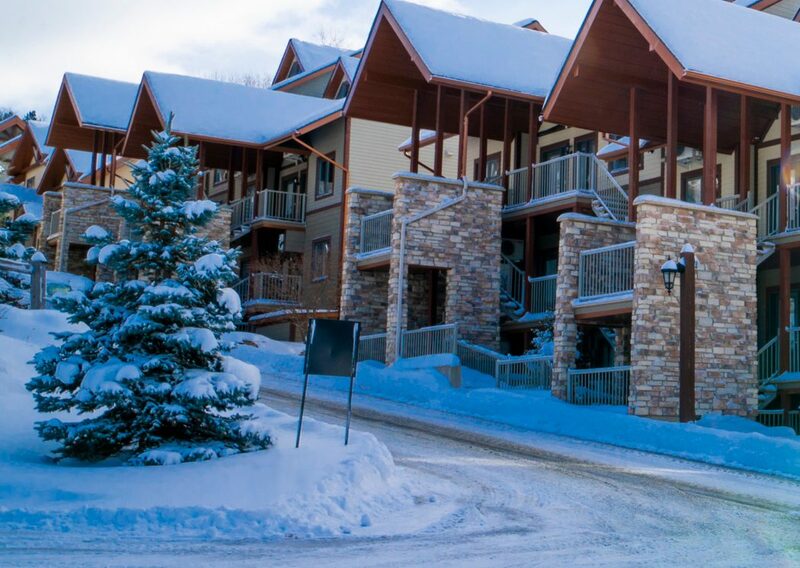 Surrounded by an enchanting nature, the condos are located directly on the ski slopes or water park of Bromont, montagne d’expériences, so you can enjoy your stay without having to drive around. 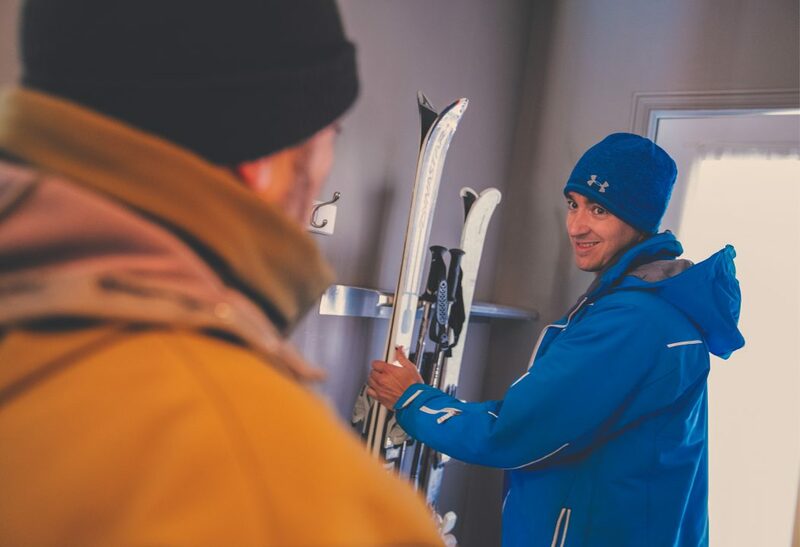 At Condo Château-Bromont you get to stay in one of our 40 units offering a direct access to the Mont Soleil slopes, perfect for a ski/in ski/out or a quick walk to the water park. 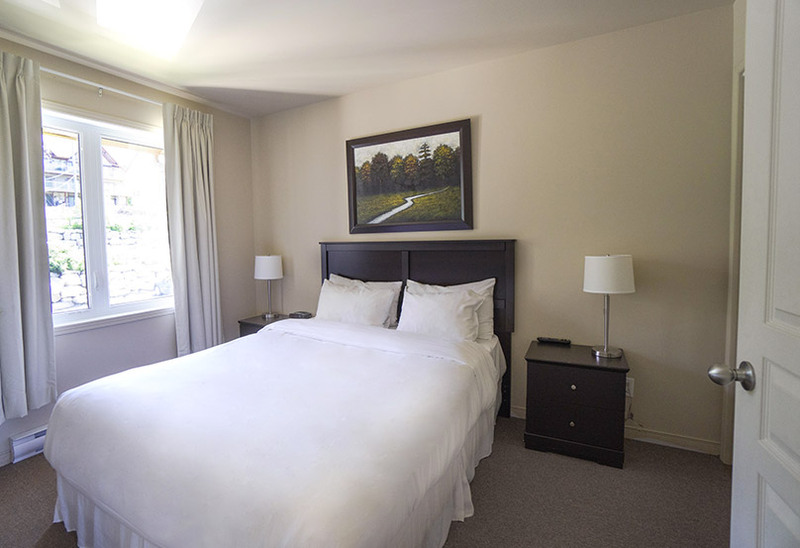 Golf players will also be delighted to know that the condos are a 2 minutes drive away from Golf Château-Bromont. All the condos have a patio where you can kick back and relax with a view of the mountain, and let the vacation feeling sink in. Our 1-bedroom condos are perfect for romantic moment as a couple or a family getaway. They can accommodate up to 4 people with their closed bedroom and sofa-bed in the living room. 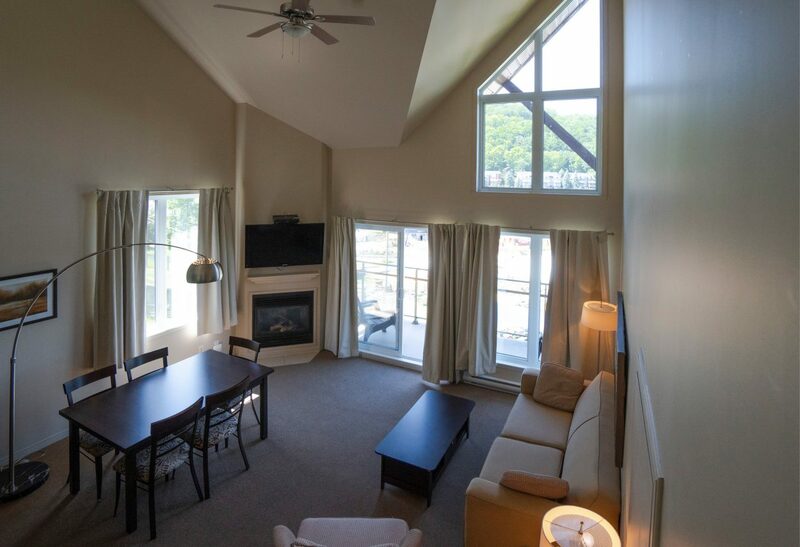 The 2-bedroom condos are ideal for big families, couples or groups of friends who want to enjoy a getaway to Bromont. Offering up to 1,050 square feet, these units can accommodate up to 6 people with 1 closed bed-room, a mezzanine with Queen bed and a sofa bed in the living room. Located on the third floor of every building, you will be mesmerized by their exceptional view! Enjoy our Relaxation at the mountain promotion and get a free access for the thermal experience of Amerispa Château-Bromont, for 2 days by booking a stay in April or in May. Discover our new gourmet baskets available when booking a stay at Condo Château-Bromont. Those baskets are to be deliver on your arrival date directly in your unit, for a worry-free moment. A deposit of 25% of the full stay will be required and charged to your credit card upon booking. The balance of the stay will be charged to your credit card on the day of your check-in. In the event of an early departure, any remaining nights will not be refundable. This code is valid from 4 PM the day of your arrival and until 11 AM on your check-out date. To ensure a pleasant vacation environment for all, please refrain from making excessive noise past 11 PM. Noise complaints received for your unit may result in penalty charges, or, if necessary, immediate expulsion with no refund. A minimum of $100 will be charged to your credit card if the unit is left in an unacceptable state. The guest accepts responsability for any missing inventory and damages to the property and authorizes Condo Château-Bromont to chage the credit card on file to pay any repair or replacement costs incurred.